Here is an unusual combination: an all new Quintrex teamed with a nearly all new Evinrude. Traditionally, Quintrex announces new models that take an expert to tell apart from those they replace. 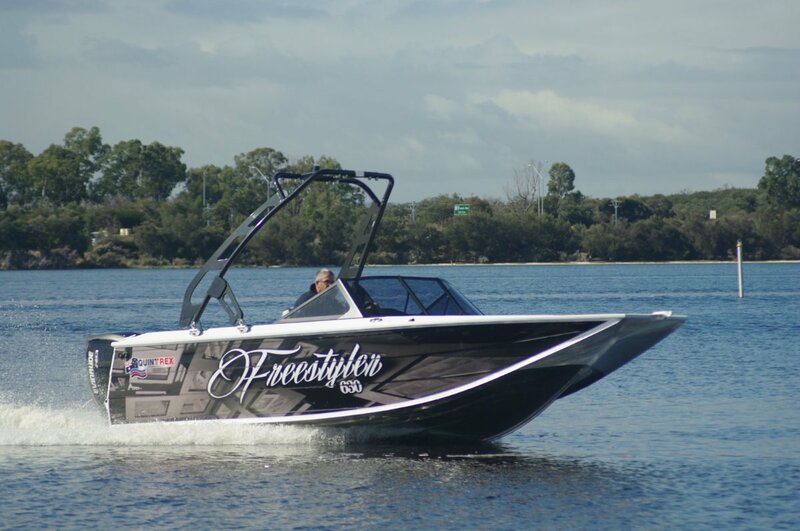 The 630 Freestyler, though, is blindingly obvious in its differences, including a new hull form named the Apex. The part of the bow that makes most of the contact with the water is as sharp as any other Quintrex’s, but above the waterline it splays forward and sideways. One result is that this bow cockpit is vastly roomier than those of other bow riders of similar size. But throughout its length this boat shows the great quantities of thought that went into fitting it out. The 150hp Evinrude ETEC is crammed with new and useful features. It has built in power assisted steering that is adjustable for sensitivity. The oil bottle is now contained within the motor cowling, and the dash multi gauge displays the remaining contents. 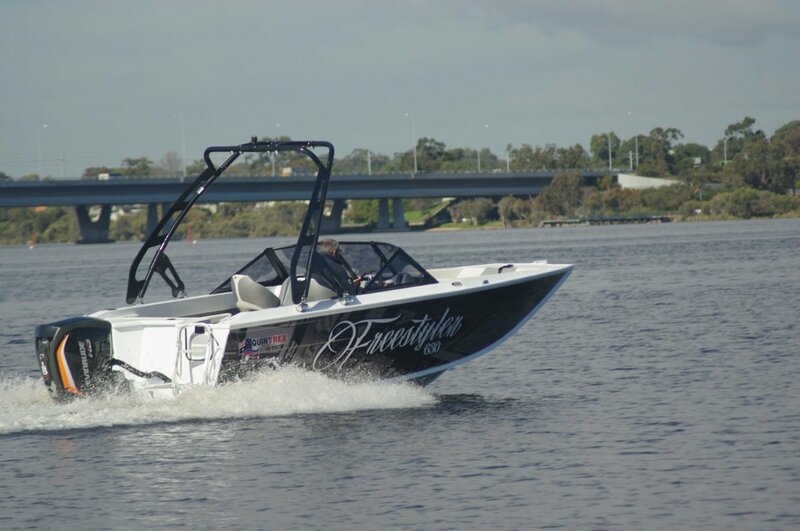 Traditional water ski tow boat drivers can choose the optional foot throttle. But the crowning feature has to be the auto trim. The motor monitors fuel consumption – which can also be read off the gauge – and adjusts trim to achieve maximum economy. Most of the time this is the best trim angle for a good ride as well; for those rare occasions when it is not you can chose to set trim manually. As for the motor’s performance - excellent. The ETEC is a two-stroke with high pressure fuel injection. All the annoyances of traditional thirsty, smoking two-strokes have been eliminated, leaving their endearing characteristic: acceleration. The 630 is rated for up to 200hp, but that extra 50hp is superfluous. Open the throttle and the response is blistering; just what a social or novice skier wants. The Quintrex’s rear end has a sculptured quality with facets, diamond style, rather than flat surfaces in a single plane. The pod carries the motor at its rear edge. This means that when the motor is not tilted the full width of the pod is available for pedestrian traffic. Taking advantage of this, Quintrex provides mounts for the boarding ladder on both sides leaving choice up to the owner. Bow riders are practically the definitive picnic boats: plenty of seats throughout the length is the key feature. They are also the most likely to be called into casual tow boat service. 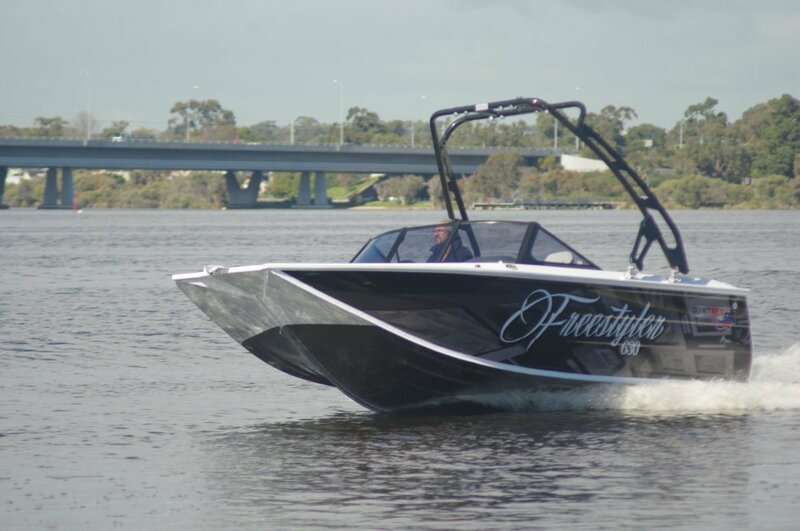 Recognising this Quintrex has fitted the 630 with a wakeboard tower, and one of the two underdeck compartments is long enough to accept skis and wakeboards. Those two are far from the total of stowage on board. There are caverns below the bow compartment’s settees, and more modest enclosed spaces within the pair of consoles. Behind the folding rear lounge is another space, the sort to contain a holdall of towels and bathers. Besides these there are pockets, drink holders and recesses galore. 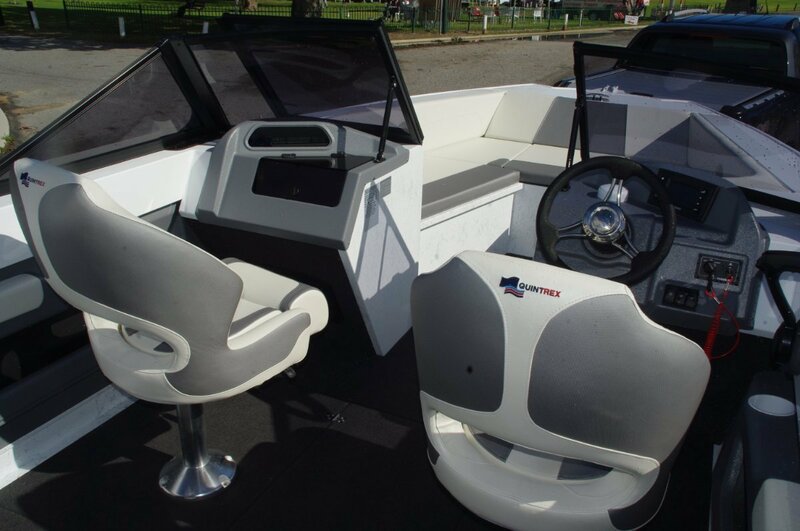 Unlike most bow riders – and most Quintrexes come to that – the 630 has a self draining deck. Despite the deck being carried higher to do that job, the coaming hits a standing person comfortably high on the thigh. This gives a hint that the 630 is not necessarily confined to sheltered waters and picnic duties; there are even rod holders in the side decks to add reinforcement to the thought. Investigating further reveals that stability at rest is very good. An extra check on the hull form with the boat back on the trailer suggests capability offshore. The evidence mounts that this is an all rounder, with tasks from serious fishing to partying at Rottnest in its menu. I was impressed by the standard and simple presence of fittings. For instance, every boat would welcome a pair of cleats just forward of amidships and most do not have them. This one does: pop up, snag free jobs. The windscreen and its framing too is impressively massive: you can stand and hang onto this one with no fear that it will come apart. Sit down and you are in excellent quality, supremely comfortable pedestal swivels. Quintrex got this one right.